An everyday life's Odyssey » Around Paris. Around Paris. There’s this old train line, that hasn’t been used for ages. 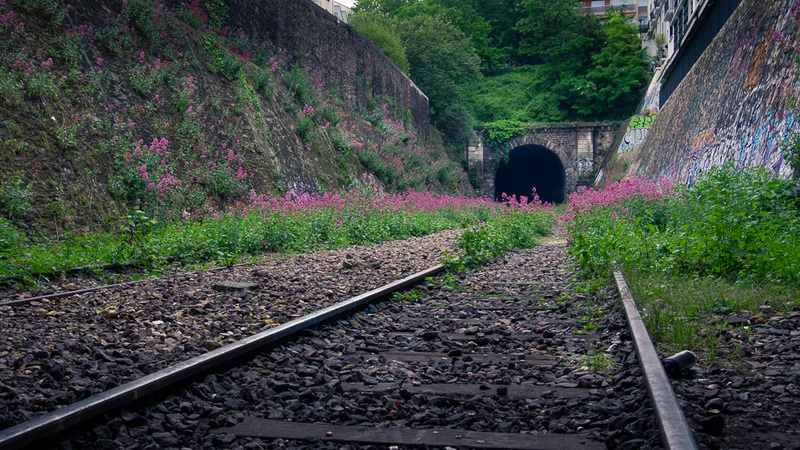 Train tracks are covered with flowers and plants, the old station are turning into concert venues, bars and restaurants. I was supposed to take a friend for a walk while his girlfriend was organizing a surprise birthday party. We went down there in the Buttes-Chaumont, and walked through two long tunnels, until we reached the Flêche d’or, a bar/concert hall above the tracks. We were more than overdue at the party, so we had to get out, but couldn’t resist to take a couple of shots.